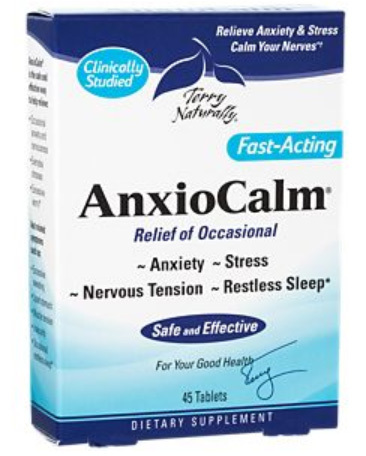 AnxioCalm, 45 Tablets (Terry Naturally) - Penn Herb Co. Ltd. Anxious? Overwhelmed? Stressed? AnxioCalm is clinically studied to quiet your nerves and relieve your occasional anxiety - without drowsiness! Perfect for everyday use, or occasionally when you need extra support. Adults: 1 or 2 tablets twice daily. Children (ages 4-12): 1 tablet twice daily.